Eliot T. Masters works for the World Agroforestry Centre (ICRAF), Bamako, Mali. Joshua A. Yidana is in the Department of Horticulture at the University for Development Studies, Tamale, Ghana. Peter N. Lovett works with the West Africa Trade Hub, Accra, Ghana. Development of non-wood products from the shea tree offers promise for both local and export trade. The integrity of the natural environment to be inherited by the next generation of African farmers depends very much on the livelihood opportunities and constraints their parents face today. It depends on small decisions made every day by local resource users, based on consideration of costs and benefits, but often with short-term considerations necessarily foremost in mind. Thus, those concerned with sustainable management of African forests and woodlands need to consider ways to add value to the renewable non-wood products of forests and woodlands which might provide practical, market-based incentives for the sustainable management and conservation of the resources. Perhaps the greatest potential in this respect lies in the commercial development of products from naturally occurring species with ready (if often undeveloped) market value. One such species, only found in sub-Saharan Africa, is the shea tree, Vitellaria paradoxa (syn. Butyrospermum parkii, Butyrospermum paradoxum), which is indigenous to a band of vegetation extending over 5 000 km from Senegal to Ethiopia and Uganda. This article describes the non-wood products derived from the shea tree, the local and export markets for them, and recent efforts to enhance market opportunities and increase returns to the primary producers by adding value, particularly through quality improvements and initiatives such as certification and fair trade labelling. The fruit of the shea tree ripens during the annual hungry season when food supplies are at their lowest ebb and agricultural labour requirements are at their peak. It is rich in vitamins and minerals and not lacking in protein. Inside the fruit is a seed rich in the mixture of edible oils and fats known as shea butter – a crucial nutritional resource for millions of rural households. The Moroccan traveler Ibn Battuta already observed regional trade of shea butter across West Africa in the fourteenth century. A few centuries later, the Scottish explorer Mungo Park noted the great importance of shea butter in present-day Mali and Senegal (Park, 1799); he made the first known botanical drawings of the tree and attempted to classify the species. Long associated with human settlements, the shea tree may be called “semi-domesticated” in that its germplasm reflects conscious selection over millennia – i.e. improvement of the species by the protection of productive individual trees on farmed land based on locally favoured criteria such as sweetness of fruit, total harvestable yield, tree health, reduced competition with annual crops, etc. (Lovett and Haq, 2000a; Maranz and Wiesman, 2003). 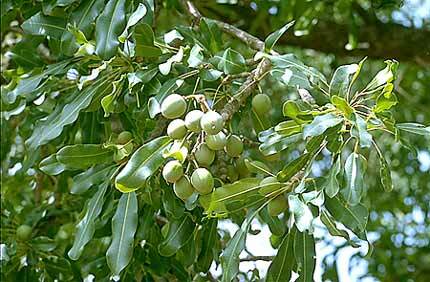 The shea tree grows very slowly, yielding its first fruit harvest after 15 to 20 years. Mature trees are preserved during land clearance for farming and thus form part of the indigenous farming system. The trees benefit from the agronomic practices employed for the annual crops such as weeding and management of soil fertility. Volunteer seedlings are managed to maturity and the tree population is controlled to avoid overshading of the annual crops. Most of the shea nuts collected each year are processed into shea butter for home consumption and to meet local market demand. However, since the first half of the twentieth century there has also been an export market for shea nuts as a cheap raw-material source of vegetable fat. Over 90 percent of shea nut exports serve the food industry; shea butter is industrially extracted, mainly in Europe, and subsequently separated into a vegetable fat fraction (stearin), sold for formulation into cocoa butter equivalents or improvers (CBEs/CBIs) and margarines, and an oil fraction used as a low-value base for margarines and as a component of animal feeds. The use of CBEs/CBIs became a political issue in Europe during the late 1990s following a European Commission directive which allowed for up to 5 percent substitution of cocoa butter by CBEs/CBIs (Official Journal Of The European Communities, 2000). Some shea stakeholders saw this directive as a major victory. However, the control of the CBE/CBI subsector by just a few companies raises questions as to how prices are determined and whether local producers and exporters can negotiate prices that will be remunerative to the producers (Fold, 2000). At the top of the market pyramid, cosmetic and pharmaceutical applications form a relatively small but fast-growing and potentially high-value market niche for shea nuts and shea butter (see Box). In recent decades, shea butter has become a valued ingredient in the finest natural cosmetics (Fintrac Coporation, 1999), and even small amounts in a formulation can earn a prominent display on the label. The cosmetic and pharmaceutical industries consume an estimated 2 000 to 8 000 tonnes of shea butter each year, and this figure is expected to rise with growing demand in new markets. Shea butter has been used for centuries (perhaps millennia) as a skin treatment in Africa, particularly for newborn infants. Although the clinical data often referred to by the cosmetic companies that market shea butter are hard to locate, recent scientific studies support its alleged therapeutic value in treatment of certain skin disorders. The bioactive substances in shea butter reside in the unsaponifiable fraction – the oil-soluble constituents that would not react with alkali to form soap – which is a by-product of the CBE/CBI production process. They include anti-oxidants such as tocopherols (vitamin E) and catechins (also found in green tea). Alander and Andersson (2002) and Alander (2004) identified other specific compounds such as triterpene alcohols, known to reduce inflammation; cinnamic acid esters, which have limited capacity to absorb ultraviolet (UV) radiation; and lupeol, which prevents the effects of skin aging by inhibiting enzymes that degrade skin proteins. Shea butter also protects skin by stimulating production of structural proteins by specialized skin cells. BSP Pharma, a joint venture between the Danish oils and fats manufacturer Aarhus Oliefabrik and the biopharmaceutical company Astion, is currently using shea unsaponifiables to produce an anti-inflammatory treatment for arthritis and a topical treatment for excema and other skin conditions including herpes lesions. BSP Pharma is also producing a “nutraceutical” shea product clinically proven to lower human cholesterol. These therapeutic uses of shea butter’s constituent compounds could considerably enhance the already significant interest in shea butter – since few products, natural or synthetic, can be credited with slowing or reversing the process of aging. However, there is the question of how much this interest will benefit the producers. Companies such as Karlshamn, a Swedish company that is another of the major players in the international shea industry, have moved to protect their investment in research and development of new uses for the unsaponifiable content of shea butter through patents on the processes by which these useful substances are isolated and enriched from their natural form. In terms of intellectual property rights, it is hoped that the ownership of shea genetic resources will be respected and legally protected for the benefit of the people of the shea-producing nations (Posey and Dutfield, 1996). To reinforce sound management to sustain the species, it is important to maximize returns to the primary producers – the farmers who make the management decisions on which the future of the tree and the ecological integrity of the landscape depend. One of the most straightforward means of adding value to any commodity is the processing of raw material into higher-value end-products – in this case the extraction of shea butter from shea nuts. Shea butter does have a higher value than shea nuts, but the value depends very much on the market on which it is sold, and in the case of local markets, on the time of year (see Figure). Traditional extraction using kneading methods yields about 30 to 35 percent butter by dry weight, while expeller methods that include the use of solvents yield up to 45 percent. Interestingly, the price of shea nuts and shea butter is approximately twice as high in the countries furthest removed from the export market (Uganda, the Sudan, Central African Republic, Senegal) as it is in those with the most direct access to export purchase (Ghana, Mali, Burkina Faso). Within West Africa, these contradictions present obstacles to the coherent stratification of product prices as a function of product quality. In Mali, for instance, the industry pays significantly less for shea nuts than in Ghana (see Table) or even Burkina Faso, given the closer proximity of those countries to accessible ports. If 1 kg of shea butter free on board (f.o.b.) ship at Tema, Ghana is valued at not more than US$1, and 1 kg of shea nuts at US$0.30 (P.N. Lovett, unpublished reports), there is not much of a margin to work with unless further ways can be found of adding value, such as developing a niche market (or range of niche markets) predicated on products of exceptional quality, or developing other products or forms of processing. Another way to add value on the production side would be to reduce processing costs by increasing the efficiency (and thus the profitability) of production. Note: This model does not include: Africa to EU shea nut transport or customs; traders’ margins; storage or processing costs. These added costs would make Mali stearin even less attractive at these costs and fat percentages. While a higher-quality butter may fetch a higher market price, it is also preferred for home consumption and will keep longer in storage than a poor-quality product. Product quality of both shea nuts and shea butter depends primarily on postharvest processing, such as parboiling of shea nuts at the start of the season to prevent the seeds from germinating and to dry them more quickly. Sun-drying of shea nut provides better quality than smoking nuts over a fire, which contaminates them with hydrocarbons. Free fatty acid (FFA) content offers a simply calculated index of quality, representing in effect the proportion lost to degradation; refining shea butter of 1 percent FFA will result in a loss of 1 percent of the original volume of unprocessed butter. Through simple improvements in processing practices, it has been possible consistently to produce shea butter of commercially accepted grades, i.e. with FFA of less than 0.5 percent. Research has also established that the typically unpleasant odour of West African shea butter (not characteristic of the eastern subspecies nilotica) results from one or more of the steps in postharvest processing, and that modifying these steps could reduce or prevent it (Lovett, 2004). There may also be scope for improving quality through identification of shea tree populations with specific chemical attributes conferring enhanced value, given the degree of chemical and genetic variation between populations (Lovett and Haq, 2000b; Fontaine et al., 2004) and the extremely specialized high-value products and market applications derived from the species’ particular component compounds (Alander, 2004). To this end, the World Agroforestry Centre (ICRAF), together with a number of collaborating institutions and with support from the European Commission, has developed a Vitellaria database (accessible at www.prokarite.org/vitellaria-dbase-EN) giving chemical profiles, including analysis of shea fruit, shea nuts and shea butter, for over 750 individual shea trees in ten countries across Africa. Recent studies have indicated that producers are willing to invest additional attention in improved product quality if they are motivated by increased returns or some other tangible benefit. For example, rural women surveyed in Mali by Action for Enterprise, a United States based non-governmental organization, indicated that they commonly invest in the parboiling and sun-drying of nuts to meet local demand for high-value shea butter, particularly at the beginning of the season when the product is most scarce on local markets and the price is high (E. Derks, personal communication). If there is demand for a higher-quality product, higher returns to producers can support investment in additional inputs (including time and labour, as well as appropriate equipment such as solar dryers). African consumers on local markets, particularly in the Central African Republic, Senegal, the Sudan and Uganda, have demonstrated that they are willing to pay more for a high-quality product. However, it is not yet clear if the export and international markets will also be willing to do so. Under current market conditions, CBI buyers may seek higher-quality nuts to reduce refining costs, and niche markets in the personal care industry may be sufficiently remunerative to support a price premium for a butter of optimal quality. But in the absence of information on whether (and how much) shea nut buyers are willing to pay for shea products of improved quality, it is difficult to predict how producers’ investment of time, effort and funds to improve processing will pay off during any given year. Purchase contracts for shea nuts in West Africa have commonly been based on a Federation of Oils, Seeds and Fats Associations (FOSFA) standard contract, which includes provisions for price premiums and penalities for quality above and below a specified baseline. However, the industry, desiring to obtain higher quality shea nuts at low cost, has been moving in recent years towards the application of a single flat rate for nuts of mixed quality. Some industry representatives felt that contract premiums based on quality were not finding their way to the producers to provide an incentive, but were rather pocketed by commercial intermediaries. However, without price incentives, product quality could tend towards the lowest common denominator. Rural men and women often occupy complementary, if not conflicting, roles in management of woodlands. Whereas women are often charged with collection and processing of non-wood forest products for household use, men are more often concerned with income-generating activities. 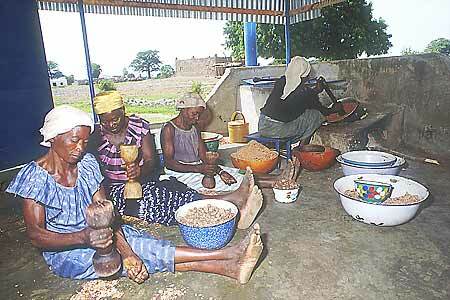 Traditionally, processing of shea butter is often carried out by informal groups of women who pool their labour. Thus in every producer country, rural women’s groups and marketing associations have an important role in the extension of processing innovations. Men are more likely to use shea tree resources to produce charcoal, which has superior quality relative to that from other woods in countries where the tree grows. To ensure sustainable management and conservation of the species and the ecosystem in which it thrives, the economic returns from shea processing and marketing must be sufficient to satisfy both men and women. IS PRODUCT CERTIFICATION A SOLUTION? In recent years, product certification according to quality criteria has been considered one avenue by which the value of shea products may be raised for the benefit of primary producers (Walter et al., 2003; Lovett, 2004). Pro­duct value is also enhanced by traceability along the supply chain and by attention to the environment (as in organic, “bio” or wild-crafted production) and to issues of producer equity or fair trade. This concept is currently under development in a regional initiative for support to primary producers of shea nuts and shea butter, the Projet d’Appui Technique à la Filière Karité (ProKarité) (see www.prokarite.org), supported by the Common Fund for Commodities (CFC) and the Netherlands Government with technical support from FAO. Implemented by ICRAF, ProKarité is seeking to develop a programme of product certification based on a harmonized set of quality parameters, norms and standards to be established at the regional and international levels (Ndir et al., 2004). In October 2004 the project held a workshop for government, private-sector and industry representatives from 16 shea-producing countries across sub-Saharan Africa to build regional consensus on technical issues of product quality as a basis for building a regionally coherent and internationally credible certification system. The certification of shea nuts and shea butter will be based not only on how the product is treated during harvest and postharvest processing, but also on origin and provenance and other aspects of production that may add value, such as organic production, producer equity and fair trade. During the 1990s, fair trade labelling of shea products was derailed during the European Union debate on fair trade standards for chocolate, since the shea butter derivatives (CBEs/CBIs) were then viewed as cocoa butter competitors (Chalfin, 2004; EFTA/NEWS, 1997). More recently, Fairtrade Labelling Organizations International (FLO) has again begun to consider fair trade labelling standards for shea products. Once established, it is hoped that product labelling could encourage consumers to purchase shea butter products obtained from women working under fair trade conditions. It may not be realistic to expect that shea nuts and shea butter of high quality will necessarily fetch a good market price for producers. Experiences across Africa indicate that total returns to production are greatest when products and markets are diversified, with a range of prices. Raising product quality standards – and documentation of other aspects of production that add value – can help establish markets for shea products of superior quality based on a tiered price system, as is the case for coffee. 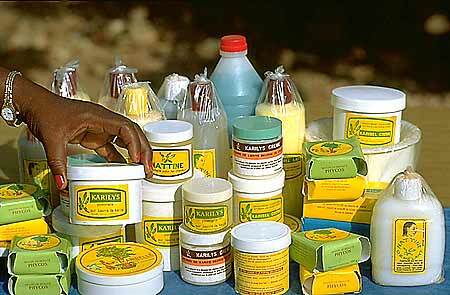 Furthermore, the realization by international buyers that the African shea butter industry is capable of producing a consistently available, high-quality product in commercially acceptable quantities should enable shea butter to compete better with other sources of similar and substitutable products. Recent case studies across Africa indicate that enhanced market opportunities for shea producers can and do have a positive influence on sustainable management of shea trees and the woodland or parkland landscapes in which they are found. During the sixth year of the Shea Project for Local Conservation and Development in northern Uganda (see Box), an inventory of woody species by size in random plots showed a strong inclination towards conservation of young shea trees on fields and fallow land throughout the project area, in stark contrast to areas outside the zone of intervention (Nkuutu et al., 2000; Lovett, Yidana and Masters, 2005). The Shea Project for Local Conservation and Development (www.thesheaproject.org) began in 1995 with pilot funding from the United States Agency for International Development (USAID). Under the project, more than 2 000 members of community-based rural women’s groups have formed the Northern Uganda Shea Processors Association (NUSPA), which currently sells several tonnes of pharmaceutical-grade shea butter to cosmetic formulators and private companies in the United States, Europe and Japan. With simple processing equipment and initial training from the Shea Project and NUSPA, rural women in neighbouring southern Sudan have established their own processing centres, which currently serve Nairobi, Kenya with a high-quality cosmetic product – a new high-value market outlet for the available surplus after the primary nutritional needs of their communities are met. Greater transparency and quality assurance throughout the supply chain is a prerequisite if the shea tree is to reach its full potential as an economic, nutritional and environmental resource for rural households across Africa and for future generations. In order for the developments in shea products trade to result in tangible improvements in sustainable management of the shea resource and associated woodlands across Africa, recent partnerships between rural producers, national policy-makers, the private sector and international industry must continue to grow, and some portion of the benefits must be channelled into better management of forests and woodlands. Alander, J. 2004. Shea butter – a multifunctional ingredient for food and cosmetics. Lipid Technology, 16(9): 202–205. Chalfin, B. 2004. 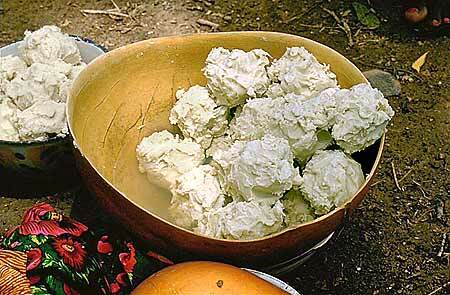 Shea Butter Republic: state power, global markets, and the making of an indigenous commodity. New York, USA, Routledge. European Free Trade Association (EFTA)/ Network of European Worldshops (NEWS). 1997. A clone is being proposed. Brussels, Belgium, OXFAM. Fintrac Corporation. 1999. Market and technical survey: shea nuts. Prepared for United States Agency of International Development (USAID) Rural and Agricultural Incomes with a Sustainable Environment (RAISE) initiative. Fold, N. 2000. A matter of good taste? Quality and the construction of standards for chocolate in the European Union. Cahiers d’Economie et Sociologie Rurales, 55/56: 92–110. Fontaine, C., Lovett, P.N., Sanou, H., Maley, J. & Bouvet, J.-M. 2004. Genetic diversity of the shea tree (Vitellaria paradoxa C.F. Gaertn), detected by RAPD and chloroplast microsatellite markers. Heredity, 93(6): 639–648. Lovett, P.N. 2004. The impact of certification on the sustainable use of shea butter (Vitellaria paradoxa) in Ghana. Unpublished paper. Rome, FAO. Lovett, P.N. & Haq, N. 2000a. Evidence for anthropic selection of the sheanut tree (Vitellaria paradoxa). Agroforestry Systems, 48: 273–288. Lovett, P.N. & Haq, N. 2000b. Diversity of the sheanut tree (Vitellaria paradoxa Gaertn C. F.) in Ghana. Genetic Resources and Crop Evolution, 47(3): 293–304. Lovett, P.N., Yidana, J.A. & Masters, E.T. 2005. 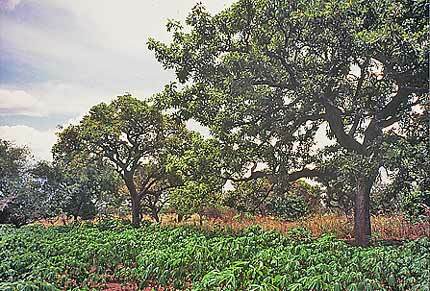 Tangible benefits encourage sustainable agroforestry parklands: management of the shea tree, Vitellaria paradoxa, in sub-Saharan Africa’s forests. Forests, Trees and Livelihoods (In press). Maranz, S. & Wiesman, Z. 2003. Evidence for indigenous selection and distribution of the shea tree, Vitellaria paradoxa (Gaertner), and potential significance to prevailing parkland savanna tree patterns in sub-Saharan Africa north of the equator. Journal of Biogeography, 30(10): 1505–1516. Ndir, B., Diop, M., Gning, R.D., Ndiaye, A., Beye, C., Kane, A., Gueye, M.T., Ndiaye, M.S., Mbaye, E.H.O., Mbaye, I., Sarr, B., Mbengue, H.M., Diao, E.H., Masters, E.T. & Guiro, A.T. 2004. Une démarche concertée au plan régional Africain pour l’amélioration de la qualité des produits du karité. Paper presented at the fourth International Conference on African Natural Plant Products: Agribusiness in Sustainable Natural African Plant Products, Dakar, Senegal, 25–27 August. Nkuutu, D., Lovett, P.N., Masters, E.T., Ojok, P. & Obua, J. 2000. Tree management and plant utilization in the agroforestry parklands of northern Uganda. Paper presented at The Shea Tree (Vitellaria paradoxa subsp. nilotica): First Regional Conference for Eastern and Central Africa, Lira, Uganda, 26–30 June. Official Journal Of The European Communities. 2000. Directive 2000/36/EC of the European Parliament and of the Council of 23 June 2000 relating to cocoa and chocolate products intended for human consumption. L 197. Park, M. 1799. Travels into the interior districts of Africa performed under the direction and patronage of the African Association in the years 1795, 1796 and 1797. In J. Swift, 1983. Travels into the interior of Africa, pp. 1–264. London, UK, Eland. Posey, D.A. & Dutfield, G. 1996. Beyond intellectual property: toward traditional resource rights for indigenous peoples and local communities. Ottawa, Canada, International Development Research Centre (IDRC). Walter, S., Cole, D., Kathe, W., Lovett, P. & Paz Soldán, M. 2003. Impact of certification on the sustainable use of NWFP: lessons-learnt from three case studies. Presented at the International Conference on Rural Livelihoods, Forests and Biodiversity, Bonn, Germany, 19–23 May 2003.